As a carver, if I had to choose just one power tool, I would plump unhesitatingly for a bandsaw. However, I'm frequently reminded that of all my machine tools, the bandsaw is the most fickle; great when set up and used right, but time-consuming, frustrating, expensive and even dangerous if misused. So, I came up with the following list of 'key features' to look for when considering such a machine. Two of the saws were battered on arrival - the packaging seemed poor considering the weight of these tools. Crushed bases, broken handles and doors off (with washers lost from the gaping box), I would be inclined to collect my purchase in person, or check very carefully before signing for safe receipt! The Ryobi was the heaviest of the saws, with a solid feel to it and seemingly more cutting power than the others, yet its maximum depth of cut was only 90mm (31/2in). On reflection, I realised that if one intends to cut fairly hard woods, 90mm is probably a realistic maximum thickness given the available power. Vibration when running was marked but acceptable, and I did wonder whether this was in part due to the base, which was bent in transit. Upper blade guides are fully adjustable; the lower guides consist of a fixed metal 'gate' with an adjustable revolving thrust bearing behind. This does not seem to provide the blade with much lateral guidance, but worked well in practice. 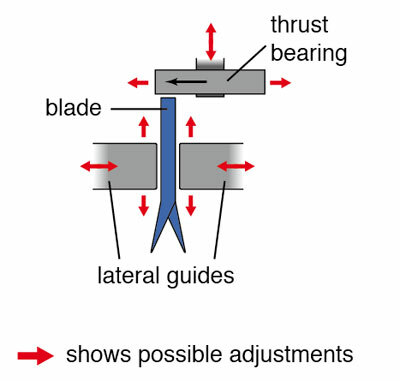 Care must be taken to always set the thrust guide far enough forward as soon as a blade is changed, as contact between the blades' teeth and the metal guides is likely to prove expensive. 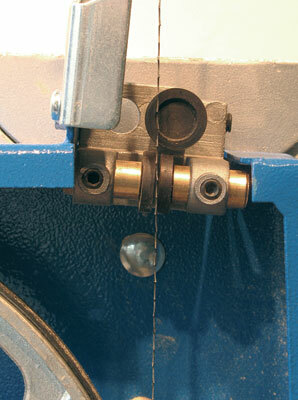 Lower guides cannot be adjusted without removing the table, which is a nuisance every time a different width blade is needed, but a common feature of small bandsaws. I must mention that the cutting fence (parallel guide) supplied is quite the most rigid and accurate I have seen. All in all, a nice solid machine, but don't expect to lift all 35kg+ on and off the bench every time you want to use it. The Scheppach is the lightweight of the trio. At under 25kg it is the only model here suitable for lifting onto a bench. Although similarly powered, I found that it tended to stall on anything thicker than 50-60mm timber, be it soft or hardwood. I wonder if I could have made more use of the 100mm (4in) maximum depth of cut if I had a skip-tooth blade? The degree of rigidity inherent in its lighter construction would suit this saw to more delicate work. This is consistent with the somewhat smaller table provided. It ran very smoothly, and the adjustability of the blade guides should accommodate narrow blades well. 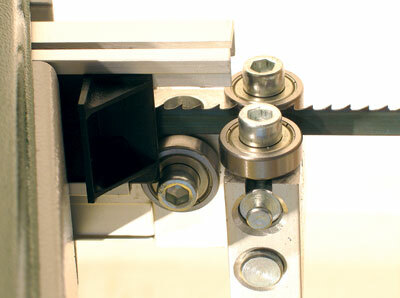 Indeed this was the only saw that allowed adjustment of the lower guides without removing the table. This makes swapping blades much easier. I would think of this machine as a compromise between the capabilities of a bandsaw and a scrollsaw. With a slightly larger motor and a greater theoretical depth of cut, the Record BS250 would appear to be the biggest of the bunch. In practice it seemed to have no greater cutting power than the Ryobi, although it did feel more refined in terms of noise and vibration. It was happy enough with 60mm (2 3/8in) thick pine or lime, but struggled with 50mm (2in) maple, and utterly refused the 80mm (3 1/8in) oak that the Ryobi just managed. Nevertheless, the saw cut straight and smoothly with the blade provided, and the inclusion of a crosscut/mitre guide was welcome - something not included with the other models. Although not part of the basic kit, Record did send a very useful stand with wheels, which is available at a small extra cost. At around 29kg, the BS250 is barely liftable with any comfort, making the stand a sound investment if permanent siting is not possible. I was surprised that three saws, rated so close in 'nominal power input' felt so different in terms of cutting capability. Unfortunately each saw came supplied with only one blade. They were all similar 6tpi regular blades and I wondered if the saws might not have performed better on thick wood when equipped with a skip-tooth blade. Another factor was the misaligned lower guide on the Scheppach, which cannot have helped it deliver power where it was needed. ...read the instructions, so they say. At risk of repeating myself, a small bandsaw is not easy to fettle satisfactorily. I felt the Scheppach instructions were fairly good, those supplied by Ryobi perhaps even better. Record's scant instructions would not, in my opinion, give a beginner any reasonable chance of getting the best out of what is a serviceable bandsaw. 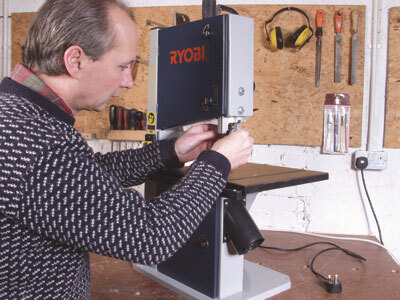 Perhaps it would be better if in all cases new users were advised to read a more complete book on bandsaw use, or even better, seek hands-on advice from an experienced user. 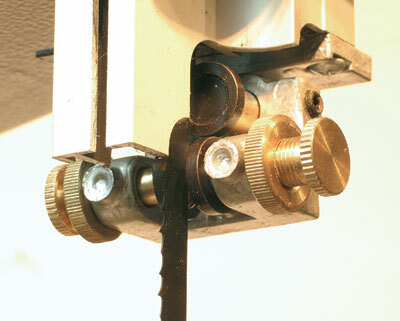 For a small bandsaw to run really well quite a number of sensitive adjustments are needed. Consequently, I think it is over optimistic to expect saws to arrive 'ready to use'. I suggest new users persuade an 'old hand' to help them unpack and assemble their new toy. If you carve mainly reliefs and smallish in-the-round pieces, the power and depth of cut may be sufficient. 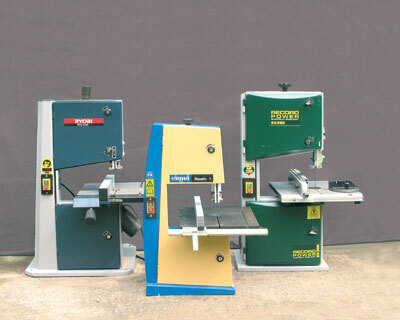 If you need to keep your bandsaw out of the way when not in use, you may not be able to consider a larger machine. No small bandsaw can do everything well. Power and rigidity give a greater depth of cut, but the extra weight will make moving and mounting more difficult. If you envisage often cutting material more than around 75-100mm (3-4in) thick, you may be better looking at the many larger saws which these manufacturers offer. Provided you spend the care and time needed to set up properly, these models will all give good service if used within their limitations. Preparing the saw and blade may sometimes seem tedious, but think of the time taken to remove the same amount of wood by hand. "I suggest that if possible new users persuade an "old hand" to help them unpack and assemble their new toy"
The sun is out but for how long?